A GREAT OPPORTUNITY PRESENTED ITSELF IN 2014. 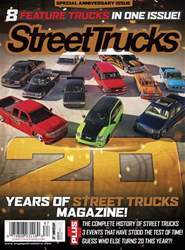 I found myself in the position to write and photograph as a regular monthly contributor to “Street Trucks” magazine, as well as the special edition “C10” and “F-100 Builder’s Guides” that pop up throughout the year. Although I was already pretty familiar with the whole writing and snapping pictures thing, I was eager to jump aboard and go along for the ride.